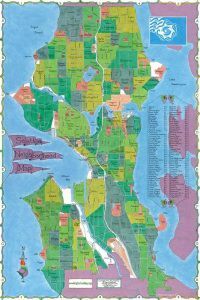 Neighborhood Map of Seattle - Colorful and easy to read! It portrays approximate boundaries for each of the Seattle neighborhoods and also includes arterial streets. The map measures 39" x 26" and is printed on glossy paper. Nice way to learn the geography of Seattle or to decorate...which neighborhood do you live in? !